The sale of the Cineworld cinema in central Dublin reveals some interesting things about the exhibition market in the Irish Republic. The deal itself is straightforward enough. 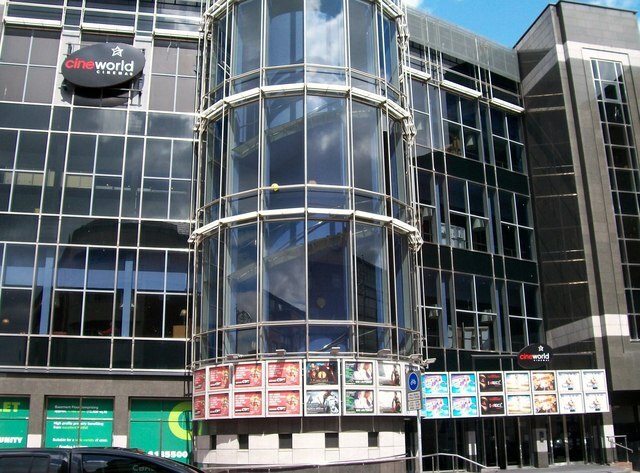 “The country’s busiest movie theatre – Dublin’s 17-screen 3,360-seat Cineworld on Parnell Street – is to change hands for €20m. With 1.4m admissions last year, the cinema is in the top five most popular film venues in Britain and Ireland. It is owned by two groups of Irish investors, who are now selling it to a British leisure company. Estate agent Jones Lang LaSalle fixed a guide price of €24m, saying it had an income of €1.9m a year.” But the interesting bit is after the talk about the IMAX screen, where it reveals what the Great Recession has done to Irish cinema going habits. “Cinema investments are attractive as admissions remain relatively steady during economic downturns. However, audience figures in Ireland have been affected by emigration. The biggest cinema-goers are those aged between 18 and 35, the age group most likely to emigrate. Adults in this bracket go to the cinema twice as much as the national average.” A further loss to Ireland. Link. India: Punjab has always been one of India’s most prosperous states, so it is no surprise that multiplex operator PVR is targeting it for expansion. “Multiplex operator PVR Cinemas today sought from Punjab government new incentives including subsidised electricity, land at concessional rate and stamp duty exemption to promote multiplexes and cinemas in the state. Having already invested over Rs 100 crore [US$16m] in Punjab, PVR Cinemas said it is now looking forward to getting state government’s support, contending the state’s new industrial policy has not “offered anything” for promoting multiplexes in the state.” Link. India: Meanwhile in the south of India, cinema owners are fretting that days may be numbered for 2.5 hour long traditional ‘masala’ films with everything and six mandatory song-and dance numbers. “”We are in the digital world and audiences are constantly distracted by social networking sites. You can’t expect them to watch a three-hour-long film patiently. Their attention span oscillates between 120 and 135 minutes. If they’re bored, they just walk out of the cinema hall,” Sreedhar told IANS. Another practical problem is faced by multiplexes while allocating showtime to lengthier movies. “In Tamil Nadu, theatres are allowed to screen only four shows every day. Every feature film is played with at least 15 minutes of advertisements and a 15 to 20 minute interval. Theatres also need turnaround time of about half an hour between shows. This time is usually spent in cleaning up the hall and managing traffic in the parking lot,” he said.” Link. USA: Come Ye Faithful – free cinema tickets this way! “American church groups are block-booking cinema multiplexes to fill seats with the faithful for opening night screenings next week of Son of God, the forthcoming film about the life of Jesus Christ. They are buying up all the tickets and distributing them to churchgoers as part of a “theatre takeover” to promote the film which is based on the hit television miniseries The Bible. Cinema chains said the pre-release buzz and demand for tickets was on a par with major blockbuster releases as pastors spread the word about the celluloid portrayal of the life of Christ from the pulpit.” Link. USA: Not Holy Communion, but the serving of secular wine in the cinema gets the editorial blessing of the local newspaper. “The Lincoln City Council seems inclined to revise city ordinances so that Marcus Theatres can serve alcohol at the downtown Grand Cinema. Good. The change would enhance the moviegoing experience for some, and bring the Capital City up to date with a national trend.” Link. Pakistan: No love for Bollywood from Pakistani authorities this Valentine. “Pakistani authorities have stopped issuing “No Objection Certificates” for the screening of Indian films, holding up the release of new movies such as Gunday and Hasee Toh Phasee. The Federal Information and Broadcasting Ministry told distributors and exhibitors of Indian films that it was processing new laws and regulations and NOCs would not be issued till these are approved by the federal cabinet.” Link. China: Someone obviously doesn’t like romantic films. “A man in Xiamen, Fujian province appeared very unpleasantly surprised after his girlfriend whipped out a ring and proposed to him in front of crowds at a cinema. The young woman, donning a nice black dress for the occasion, got down on one knee and popped the question as onlookers snapped pictures on camera phones. He very reluctantly put the ring on her finger before the (maybe) bride-to-be swooped in and gave him an enthusiastic hug.” Link. USA: Another cinema wakes up to the benefit of arranging autism-friendly screenings for children and parents. “When you go to the movies, you probably expect dark lighting and loud noises, but this kind of environment isn’t always good for children, which is why Promenade Cinema is offering a different kind of movie-going experience. “A ‘sensory friendly’ movie is one where the lights are a little brighter and the sound is a little quieter, just to make it a more comfortable environment for those on the autism spectrum or with other disorders,” Main Street Theaters Spokesperson Andrea Barstow said.” Link. USA: And here is another one. “For children with autism, the whole moviegoing experience can be too much to tolerate. But it wasn’t for those who attended a special showing Saturday morning of “The Lego Movie” at Cinemagic Grand at Clarks Pond. The children could talk as loudly as they wanted and even dance in the aisles if they saw fit. “They can move around and sing along,” said David Headley, manager of the South Portland theater.” Link. UK: It seems like Empire’s inability to finish building its multiplex in London’s suburb Ealing is attracting local ire. “GRAFFITI knitting adorned the Ealing Empire Cinema site on Saturday as a mark of protest. West Ealing Women’s Institute used hoardings surrounding the cinema as a canvas for their knitted protest against there being no dedicated cinema in Ealing. Lorna Barton-Nicol, president of West Ealing WI, said: “It’s outrageous that, given Ealing’s historic contribution to film, we still don’t have a dedicated cinema.”” Link. UK. “Plans to demolish town centre department store Beales and replace it with a £10million entertainment complex have split opinion in Harrogate. Last week, the Advertiser exclusively revealed 250 jobs would be created, should Harrogate developer 4Urban’s plans to build a four-screen Curzon cinema and three restaurants gain approval. Now, readers have contacted us using the many feedback platforms available to have their say.” Lack of parking and oversupply of restaurants seem to be some of the main issues raised. Link. UK: “The owner of Bexhill’s last remaining cinema is “very sympathetic” towards plans to restore it but wants to see “the best possible return” from its investment. Last week representatives from the Ormiston Trust met with members of the Bexhill Community Playhouse to look over the empty premises in Western Road. The campaigners have been promised a £500,000 grant from the Social Investment Business group to buy and repair the building for community use and wanted to prove realistically the building was not worth what the charity is asking.” Link. USA: “According to a press release sent Thursday by Hometown Cinemas, the movie theater in Gun Barrel City has a new owner, or nearly so. The Gun Barrel City Council has to agree to help Hometown Cinemas open the new theater through approving a number of concessions totaling about $205,000 over five years. HomeTown Cinemas managing parter Randy Hester told The Monitor should all go well, he is aiming to open in early April in time for the new summer movie releases.” Link. UK: Bolton already has a proposal approved for a nine-screen cinemas. Seems like that is not enough. “Proposals to build a new 11-screen cinema in Bolton’s Crompton Place Shopping Centre have been submitted. This comes just after the approval of planning permission for a cinema at the nearby Market Place shopping centre. Agent Simply Planning has lodged plans with Bolton Council to change a number of existing vacant retail units in the centre into a cinema and restaurants. The proposals for Crompton Place are for an 11-screen cinema providing a total of 1,300 seats as well as four medium-sized and one large restaurant.” Link. France: Conde Nast Traveler has a list of the six best cinemas to visit in Paris. “The once-200 cinemas have gradually dwindled to less than half, but thankfully—in an age of multiplexes—a third of these are still independently run (and have played a vital role in the careers of filmmakers such as Jean Cocteau and Francois Truffaut). Here are some of the most intriguing and historic independent cinemas across the French capital.” Link. Concessions: Important news for all CelluloidJunkie readers below the age of 13, as well as anyone else interested in Justin Bieber’s concession preferences. “Justin Bieber spent $250 on snacks during a recent trip to the cinema to see ‘Ride Along’ in Atlanta, Georgia – and generously bought his entourage of 10 friends a range of sweet treats. Among the items consumed and his friends were seven hot dogs, four boxes of nachos – all with extra cheese – eight different bags of sweets, including M&Ms, Snickers Bites and a Butter Finger as well as six ice creams. 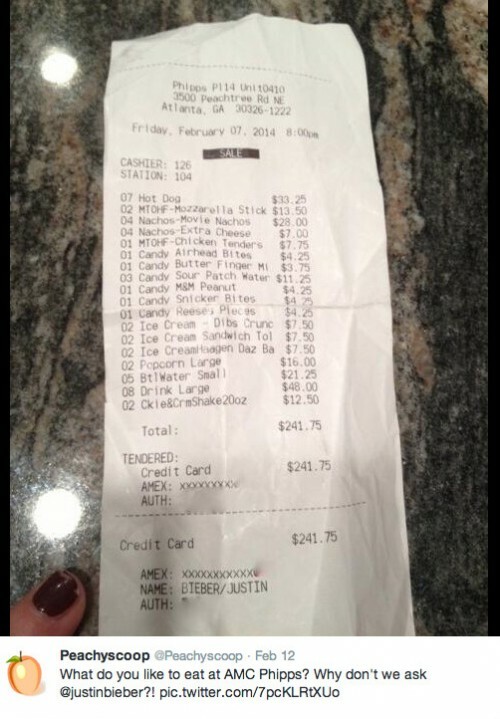 He also had eight large sodas, five bottles of water and one cookie and cream milkshake.” Link.